Members of a recycling club at IS 217, a huge school in Jamaica, are working to make it a zero waste building. We’ve been visiting middle schools in southeast Queens. Here are some of our favorites. Be sure to see our lists of schools that accept children from throughout the borough of Queens and those open to to children from anywhere in the city. Applications are due Dec. 1. Why we picked it: Hands-on activities and expeditions encourage students to solve real-life problems; NEST program for students on the autism spectrum. 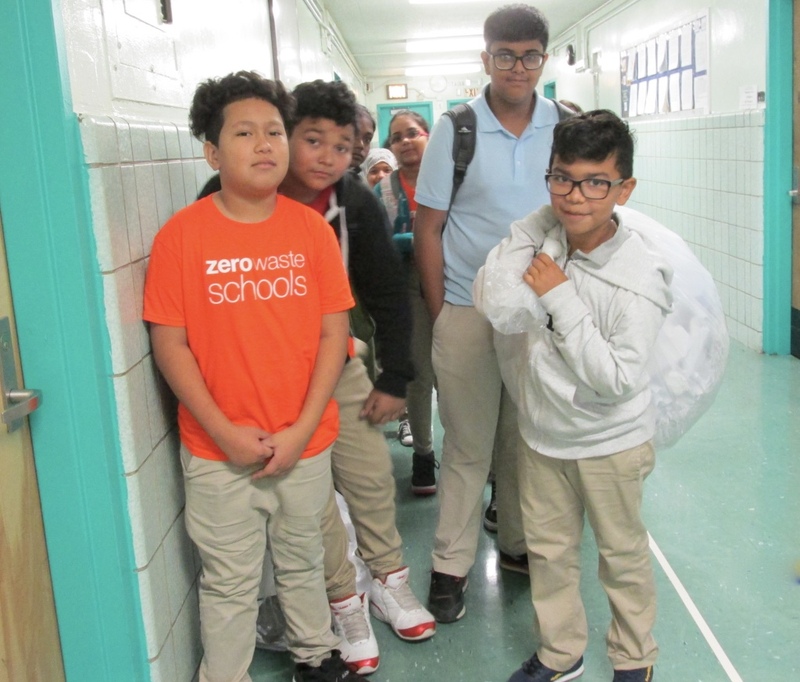 Who gets in: Residents of District 27 get priority but all Queens students have a shot based on 4th grade tests and scores, attendance and punctuality, interview and a writing sample. Why we picked it: Kids like attending this small school that emphasizes family; good for special education students. Who gets in: Randomly selected students from the zone get priority, followed by those from anywhere in District 27. Why we picked it: Diverse with demanding academics and ample arts offerings; good with engaging girls in science and technology. Who gets in: School has its own application which must be submitted by Dec. 7, 2017. Admission is based on 4th grade grades and test scores, an interview and the school’s own assessment. Open to students from throughout the city, but priority goes to the district students and those who live on the peninsula. Why we picked it: Small and safe with nationally recognized Core Knowledge curriculum that stresses history, science and culture. Who gets in: Students from throughout District 27 based on 4th grade scores and grades, behavior, attendance and punctuality, along with performance on an entrance exam. Why we picked it: Strong leadership, good teaching and a focus on the environment. Who gets in: District 28 and District 25 students. Why we picked it: Attractive new building, opportunities to major in dance or coding; violin program. Who gets in: Students from throughout District 28. Why we picked it: Challenging academics, safe and orderly; middle school students get preference for the highly regarded high school. Who gets in: Randomly selected kids from throughout District 28, with preference going to those who attend an event. Why we picked it: Attractive campus with excellent facilities; good academic performance; initiatives aimed at boys and fathers. Who gets in: Students who attended elementary school get priority with remaining seats going to randomly selected students from throughout District 29. Why we picked it: Small school with lots of writing and group work; all 8th graders take some high-school level classes. Who gets in: Randomly selected residents of District 29, with preference going to students who attend an information session. Why we picked it: High-performing school with demanding academics; middle school students can remain for high school. Who gets in: Kids from District 28 and 29, based on their 4th grade grades, test scores, attendance and punctuality.